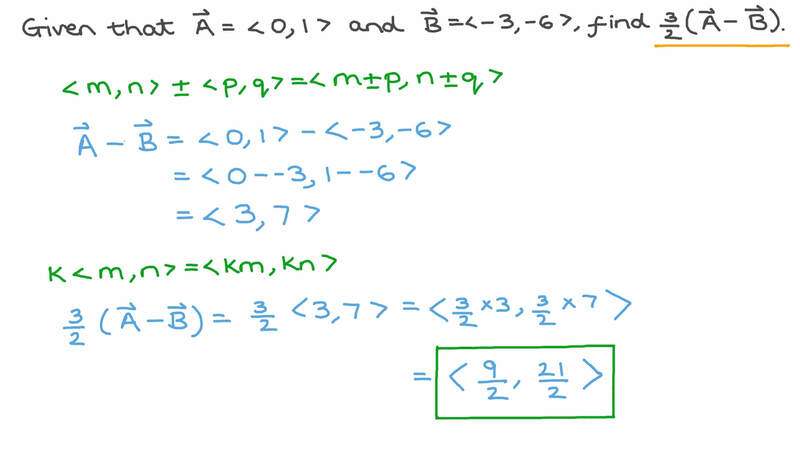 In this lesson, we will learn how to solve operations on vectors algebraically such as vector addition, vector subtraction, and scalar multiplication. Given that ⃑ 𝐴 = ( 0 , 1 ) and ⃑ 𝐵 = ( − 3 , − 6 ) , find 3 2  ⃑ 𝐴 − ⃑ 𝐵  . Given that ⃑ 𝐴 = ( 0 , − 1 ) and ‖ ‖ 𝑘 ⃑ 𝐴 ‖ ‖ = 1 2 , find the possible values of 𝑘 . Given that ⃑ 𝐴 = ( 2 , − 4 ) and ⃑ 𝐵 = ( − 7 , − 6 ) , find ⃑ 𝐴 − 4 ⃑ 𝐵 . A force of newtons is being applied to an object. What other force should be applied to achieve a total force of newtons? Given that u = ⟨ 0 , 4 ⟩ and v = ⟨ 0 , − 5 ⟩ , find the components of u v + . Given that u = ⟨ 2 , − 3 ⟩ , v = ⟨ − 5 , 4 ⟩ , and w = ⟨ 3 , − 1 ⟩ , find the components of u v w + + . Given that u = ⟨ 2 , − 3 ⟩ , v = ⟨ 3 , 2 ⟩ , and w = ⟨ − 1 , − 5 ⟩ , find the components of u v w + + . Given that u = ⟨ 2 , − 4 ⟩ and v = ⟨ 0 , 0 ⟩ , find the components of u v + . Shown on the grid of unit squares are the vectors u , v , and u v + . What are the components of u ? What are the components of v ? What are the components of u v + ? The figure shows a regular hexagon 𝐴 𝐵 𝐶 𝐷 𝐸 𝐹 divided into 6 equilateral triangles. Which of the following is equal to  𝐵 𝐸 +  𝐹 𝐴 ? Given that u = ⟨ 2 , − 4 ⟩ and v = ⟨ − 2 , 4 ⟩ , find the components of u v + . Given that u = ⟨ − 3 , − 1 ⟩ , and v = ⟨ − 2 , 5 ⟩ , find the components of u v + . Given that u = ⟨ 3 , 1 ⟩ and v = ⟨ 2 , 5 ⟩ find the components of u + v .
On a lattice, where  𝐴 𝐶 = ( − 5 , − 5 ) ,  𝐵 𝐶 = ( − 1 2 , 6 ) , and 3 ⃑ 𝐶 +  𝐴 𝐵 = ( − 8 , 1 3 ) , determine the coordinates of the point 𝐵 . On a lattice, where  𝐴 𝐶 = ( 3 , 3 ) ,  𝐵 𝐶 = ( 1 3 , − 7 ) , and 2 ⃑ 𝐶 + 2  𝐴 𝐵 = ( − 4 , − 4 ) , find the coordinates of the point 𝐶 . Given that ⃑ 𝐴 = ( − 4 , − 1 ) and ⃑ 𝐵 = ( − 2 , − 1 ) , express ⃑ 𝐶 = ( − 8 , − 1 ) in terms of ⃑ 𝐴 and ⃑ 𝐵 . If ⃑ 𝐴 = ( 1 , 2 , 1 ) , ⃑ 𝐵 = ( − 1 , − 1 , 0 ) , and ⃑ 𝐶 = ( − 2 , − 1 , 1 ) , express ⃑ 𝐶 in terms of ⃑ 𝐴 and ⃑ 𝐵 . When is it true that u v v u + = + ? When is it true that ‖ + ‖ = ‖ ‖ + ‖ ‖ u v u v ? ⃑ 𝑉 and  𝑊 are two vectors, where ⃑ 𝑉 = ( − 1 , 5 , − 2 ) and  𝑊 = ( 3 , 1 , 1 ) . Comparing ‖ ‖ ⃑ 𝑉 +  𝑊 ‖ ‖ and ‖ ‖ ⃑ 𝑉 ‖ ‖ + ‖ ‖  𝑊 ‖ ‖ , which quantity is larger? CThey are both the same. Find all the possible values of 𝑚 given ⃑ 𝐴 = ( − 4 , 3 , 1 ) , ⃑ 𝐵 = ( 6 , − 6 , 𝑚 − 1 3 ) and ‖ ‖ ⃑ 𝐴 + ⃑ 𝐵 ‖ ‖ = 7 . Given that ⃑ 𝐴 = ( 3 , 3 ) and ⃑ 𝐵 = ( 4 , 6 ) , find 1 2  ⃑ 𝐴 + ⃑ 𝐵  . Given that ⃑ 𝐴 = ( − 9 , 4 ) and ⃑ 𝐵 = ( 3 , − 2 ) , find − 1 2  ⃑ 𝐴 + ⃑ 𝐵  . Given that ⃑ 𝐴 = ( − 7 , 6 ) and ⃑ 𝐵 = ( 9 , − 7 ) , find 3 2  ⃑ 𝐴 − ⃑ 𝐵  .